Don’t let that loss hurt. Draw inspiration from it. That should be the message from the Eels loss to the Broncos. Players should never be satisfied with a strong performance in defeat. The aim for every match is victory. Parra lost, again, so nobody would be strutting around pleased with what went down. That said, this was a defeat from which plenty can be taken. But before looking for the positive, let’s not gloss over some of the continuing problems. Errors again featured, and the Eels certainly get punished on the scoreboard for most. The first 15 minutes of the game basically set the game up for the Broncos. A line-ball offside penalty against the Parramatta kick chase (after Moeroa was held up one play earlier) led to a spectacular individual try to Osako. 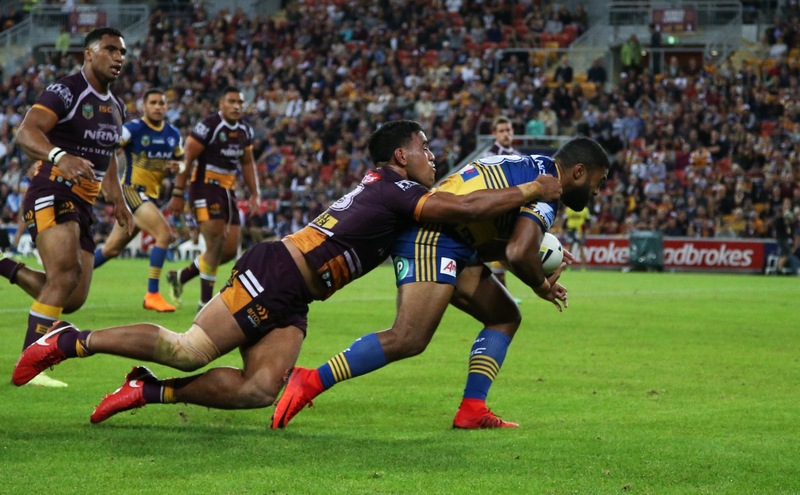 In both instances, errors from the Eels were spotted by the referees and the tries were scored as a direct consequence. The third try resulted from clever play from the Broncos. The quick identification of Brad Takairangi not being properly set and balanced in the defence line was rewarded via perfect execution and the pace of Roberts. Classy teams will seize those opportunities and the Broncos were the epitome of class in that moment. Across the balance of the game, my greatest concern surrounds the mid-field kicking game from the Eels. Every week, mid-field bombs or high kicks directly to the fullback are the norm. Yet I know that this is not part of the game plan. It’s confusing as to why it continues. I’ve read some criticism of the kick-chase, and there is that saying – “a kick is only as good as its chase.” Whilst acknowledging that there are some occasions when there could be someone competing for the ball, it’s apparent that the team are trying to maintain a straight line in chasing poorly placed kicks. It’s an aspect of Season 2018 that must be improved. It’s also impossible to ignore lost try scoring opportunities. The Eels crossed the line four times for one intercept try. It could be argued that Jennings second dropped ball was literally in the act of scoring. How can this be rectified? It’s arguable that the body position of Eels players is too high as they cross, allowing the opposition to hold the player up or get access to the ball for a strip. This could be a consideration for the coaches. That said, the 50/50 calls don’t seem to go the Eels way with last pass or strip calls. It may seem like I’ve again identified aspects of the Eels play which point ownership for the loss at the Eels. Any fair minded supporter would not ignore the errors or poor execution which typifies the Eels season. Last night was very much passion without precision. However, let me be clear. I was fuming about the officiating last night and believe that it was a major factor in the loss. It was reminiscent of the 2017 Finals match against the Storm. It’s my opinion that not one 50/50 call went against the Broncos. Forward passes, interference on the kick chase, professional fouls that should have resulted in a sin bin, the strip on Jennings – every decision fell their way. It is often said, “that’s footy. It all evens out.” I’m still waiting for the roundabouts to follow the swings in that regard. Of course, there’s nothing to be gained from focussing on the shortcomings of Ashley Klein and his mates. In my opinion he should not be controlling NRL matches, but as he still gets appointed to a frustratingly large number of Eels fixtures, it’s up to the team to improve their performance. In recent weeks, the Eels have lost matches to teams who should have been beaten. In those clashes, Parramatta have played some awful football. It hurt, but the Eels should draw inspiration from their effort. Against the Broncos, the effort level from Parra was possibly their best of the year. There were a couple of defensive misses, but all teams will miss tackles. For the great majority of the game the players worked themselves to exhaustion. Nothing was left in the tank. Parramatta’s much criticised forwards measured up against their much bigger opponents. It’s been the trend from round 7 onwards. The stats confirm the inroads made in attack. The Eels made 1617 metres to the Broncos 1480. Parramatta matched the Broncos 6 line breaks and their carries resulted in 35 tackle breaks to Brisbane’s 30. The message to the players can be clear. That level of commitment had you close, very close, to defeating a talented opposition. Perhaps a different official would have seen a number of crucial calls differently. Perhaps, on another night, Jennings holds onto the ball both times. It may be a case of “what ifs” but this really was one of those matches. Feel energised by proving to yourselves, and to your supporters, that you can and will compete with the best. Commit like that every week and the victories will follow. It’s something different every week. The frustrating part of this was not getting the 50/50 calls, making more errors, and still being well in the contest. I don’t have the answer regarding the kicks Colin. It’s confusing. The commentators made a few comments about how things don’t fall your way during tough times. We’ve got plenty to blame ourselves for this year. We hardly need calls and the bounce of the ball to go against us too. Pete, whenever we leave nothing in the tank like that, I won’t complain. Attitude and execution is poor. Sadly Wenty did not look much better yesterday against the bears.